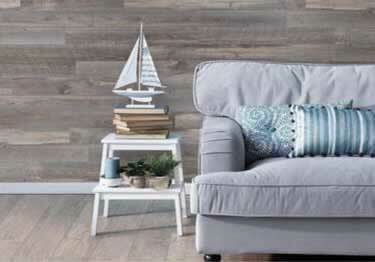 Create a beautiful accent wall with these easy to install peel-and-stick Wall Planks. Available in a variety of colors and textures that compliment your interior design. Koffler is offering five Wall Plank styles: Wilderness, Whitewash, Olive, Cookie, and Autumn. The wall planks may be installed vertically or horizontally on walls in a variety of patterns. Or you can even install them on ceilings! Planks have 3-ply engineered construction with a hardwood top veneer, wood fiber core, and hardwood bottom veneer. Put the perfect finishing touch on using the available matching trim to cap the wall or create a corner. The wall planks and the wall trim feature industrial grade, flexible, double sided bonding adhesive making installation super simple - just peel and stick! For interior use only. Not for use in high humidity environments. May be installed on ceilings using 18 gauge finishing nails every 16". See Installation Instructions shipped with the product for details. Autumn wall planks are a beautiful rendition of French Oak wall plank that ages to a dark grey-brown color that complements both rustic and modern interiors. Cookie: wall planks provide the warm, natural feel of oak. The rich taupe and brown colors are beautifully contrasted with white washed wire brushed texturing, delivering an elegant, warm feel. Note: Wall Planks and Trim should not be installed in high humidity areas like saunas or bathrooms with tubs/showers. Note: Wall Planks and trim are not load bearing. Wall d�cor like mirrors, pictures, etc must be mounted by drilling through the Wall Plank to the underlying wall to the wall studs. Use proper hardware. See Frequently Asked Questions and Installation Instructions PDF for more details. Create a beautiful accent wall with these easy to install Wall Planks. Available in a variety of colors and textures that compliment your interior design. Koffler is offering five Wall Plank styles: Wilderness, Whitewash, Olive, Biscuit, and Autumn Mist. Thank you for your review. We are glad you found this product to be easy to install and, of course looking like real wood, which it is. We have had tremendous success with or customers primarily because of the areas you mentioned. Smooth metal available in stainless steel, galvanized steel, brushed aluminum, or 17 color choices. Smooth Metal Chair Rails provide a sleek modern look to any commercial or residential wall.